ESET is a global IT security company. Their products protect over 100 million devices around the globe. They approached us to solve a difficult problem; to redesign a highly complex management tool for a very specialised user group. The product was ESET’s Remote Administration Console, used by businesses to monitor and maintain the security of thousands of devices within their network. ESET illustrated the end user to us – a trained security expert, at ease with complexity, and capable of mastering the Remote Administrator UI. For us, user research is essential in projects of this nature however, ESET were reluctant – IT security is a sensitive area, IT admins are busy people, research had never been done before. Ultimately we completed the research – what we discovered completely redefined the product. We found no expert users; in fact most had no formal training at all, and as a result the majority of the system’s functionality lay unused. The majority were happy to Set & Forget, using default configurations and trusting ESET to take care of the rest. We detailed user personas to guide the design process. 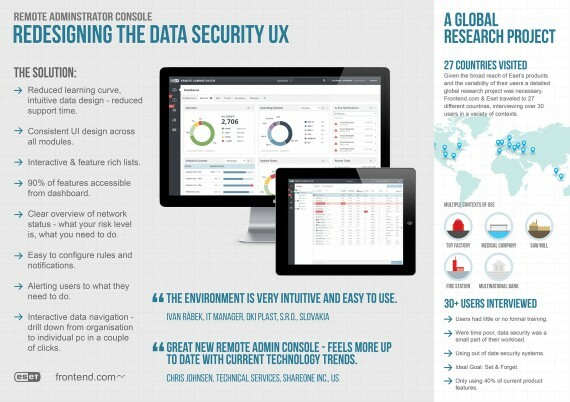 We understood how users want to monitor and control threats. Over 2 years we created a streamlined solution with interactive dashboards, guided task flows, intuitive UI behaviours and a new clean web look and feel. The result is a console that works for businesses big and small – and one the radically optimizes the performance of the product. Reactions from customers were equally positive. “Its one of the most intuitive security servers that I have ever used – I cannot see why a security team would choose anything else” – ESET Customer – USA. “The Remote Administrator Console made installing ESET over the network simple. The pre-defined policies enabled the set-up to work ‘out-of-the-box’.” ESET Customer, UK. “The new console is quite intuitive and rather easy to use” ESET Customer, Poland. “Thanks to the central management feature, the system can be administered remotely, so there is no need to travel between our 75 different sites.” ESET customer, Hungary. ESET’s Remote Administration Console has taken the field by storm with over 1million customer installs since launch. The impact of the design has not only given ESET a competitive advantage, but also a new customer focused approach to product development.